Capt. 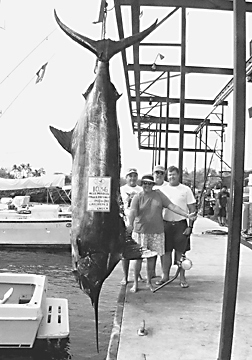 Chuck Haupert had the CATCHEM I cruising down the 1,000-fathom line outside Kawai when an enormous marlin rose and engulfed a purple Softhead lure running on a 50-class rig loaded with 50-lb test line. It may have been April Fools Day, but Paula Pattinson wasn't fooled--she was in for a fight! It lasted three hours and crewman Dave Bertuleit was on hand to put an end to it.